It's a busy world that we live in today, and the traditional pen-to-paper list or post-it note has inspired a whole flock of developers around the world to come up with a variety of cloud-based platforms and mobile apps that take productivity and organization to a whole new level. 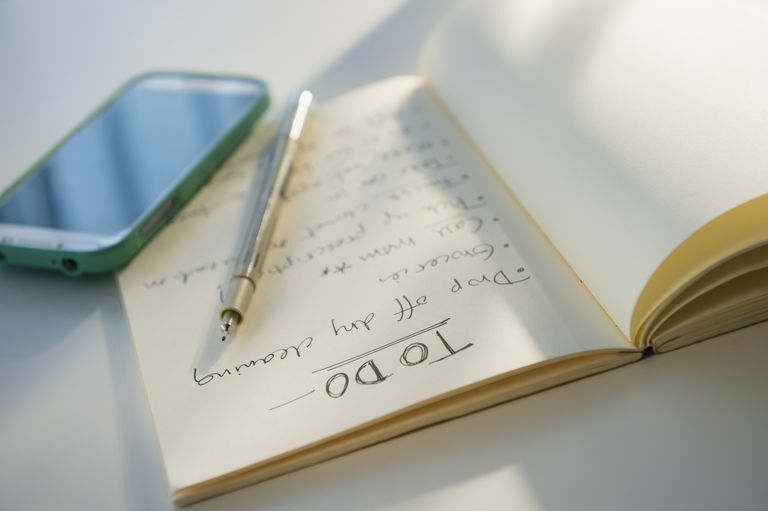 Mobile devices allow us to take our notes and to-do lists with us anywhere, so why not take the time to find a proper app that gives you exactly what you need rather than resorting to your smartphone's default bland and boring note-taking app? There are lots of app choices out there! Check out the following list of incredible apps for all your list-building, note-taking, and calendar-scheduling needs. Each app offers something a little different, but all of them work by storing your information in the cloud so that everything can be synced and accessed from almost any mobile device or computer. Organizes tasks by time, rather than by specific lists. “Moment” feature summarizes your day and allows you to move tasks to different days. Some features available only with upgrade ($30+ per year, depending on number of devices). Not ideal for those who prefer category-based task organization. Any.DO really delivers on simple and intuitive gesture-based functionality. Easily plan out all your tasks for today, tomorrow or for the entire month with all sorts of lists of items that can be easily checked off with a simple swipe to your device's screen. You can separate lists between personal or work, add reminders, build a grocery list or make your list on the go with its speech recognition feature. All of your lists and notes can then be seamlessly synced for accessibility across all of your devices. Lacks features typical of other options. Can’t create to-do lists that can be checked off on completion. Simplenote is another app that takes the minimalist approach but still offers a powerful way to maintain all your lists and notes. This is a productivity app that was built for speed! Tag or pin any of your notes, and use the search function to instantly find anything you're looking for. All of your list activity is backed up, so even when you make changes to them, you can go back to previous versions when you need to. Can organize lists and notes into notebooks. Lists can include web clippings, videos, recipes, and much more. Free version limits access to two devices. Evernote is one of the most popular cross-platform tools people use to maintain all sorts of things — photos, documents, videos, recipes, lists and so much more. If you use Evernote regularly from a desktop computer, including the Evernote Web Clipper tool, having all of your to-do lists and notes kept in one simple place may be ideal for you. Make a new note, sync up your Evernote account, and all of your notes will be available on all of your devices. With a free subscription, you can access your Evernote notes on up to two devices. Web version can be glitchy. Premium subscription is $19.99 per year or $1.99 per month as of January 2019. Todo Cloud is an incredible tool designed to be used both on the desktop and mobile for creating lists and staying organized — particularly if you're working in a team and need to share all of your tasks and progress with others. Although everything Todo Cloud has to offer isn't exactly free, it does offer a free trial of its best features. The real power of this app comes from taking advantage of its premium subscription features. Share lists, assign tasks straight from within the app, leave comments, geotag notes, receive email notifications and do so much more with this fantastic award-winning app. Lots of customizations for managing tasks in various ways. Syncs with web version for access anywhere. Settings are somewhat obscure and clunky. Some features, such as file storage and unlimited number of items per list, require paid subscription. Toodledo is another premium to-do list tool that is powerful both on a regular computer and on its mobile apps, with seamless syncing. Not only can you keep great lists, but you can also track the priority of each task, set start dates or deadlines, automate repetitive tasks according to your schedule, set audible popup alarms, assign tasks to folders and so much more. There are so many ways to get organized with this one, and like Todo Cloud, it also allows you to collaborate with other team members on shared projects. If you're looking for a tool that offers more than just simple list management, this one is worth trying out. Very simple to use, despite bevy of features. No integration with Google Calendar. Could there be a better name for a to-do list app than Remember The Milk? Don't be fooled by its name — this little app does so much more than help you build a grocery list! Add new tasks while on the go, prioritize all your items, set due dates, add tags, build "smart" lists and sync everything up to Remember The Milk online once every 24 hours with the free version. Unlimited syncing and additional features are available with a pro account. Lists can be categorized and customized so they work for you. Easily add people to list to share it. Intuitive interface makes it easy to learn. Lacks calendar feature and integrations with other apps. Push mobile notifications can be annoying or helpful, depending on preference. If you plan on collaborating with other people on all your list-managing activities, Wunderlist is worth checking out. Easily create lists and check off each completed task as you go, access your list members to share your lists with others and of course sync everything across all your devices. Wunderlist Pro accounts offer a range of additional features including file sharing for a variety of different file formats, the ability to assign to-dos, options for list members leave comments and so much more. Plenty of features available in free version. Solid support and large user community for help with advanced features. Rearranging tasks can be cumbersome. If you want a simpler, cleaner look to your to-do list app but still chock full of all the features you need to keep detailed notes and to collaborate with others, then Todoist might just be the app that you best fits your needs. Amazingly, its most useful collaborative sharing features don't require an upgrade to a paid app, although you can upgrade to premium for more advanced features. Share projects, assign tasks, create schedules, set due dates or recurring dates, receive reminders, and sync everything across your account. This is perhaps one of the best all-in-one list apps with the most generous offering of free features. Great for those who prefer visual organization. Interface sports Google’s clean design. Can create notes from voice, photos, lists, and links. No way to organize notes effectively. Android users will love this one. It's even available for iOS users too! Google Keep is a powerful productivity app that you use through your existing Google account, which is also available on the web and as a Chrome add-on, so everything can be synced up and accessed from whatever device you're using. Keep adopts a simple Pinterest-like format for creating lists and notes, which may not be ideal for everyone, but looks great when you use photos and create very quick, short notes to remember. If you think you'd enjoy a more visual look at your lists, this list app may be the app for you! Easy to export and share. Speaking of visual to-do lists, for the extreme visual learner who is a big fan of mind mapping out their tasks, MindNode is a premium app that offers an intuitive way to map out your ideas or lists on the computer or within the app — of course with the ability to have everything synced up on all devices. Through simple gesture-based functionality like drag-and-drop or a simple tap of your finger to create a node, you can map out your latest new idea in seconds.